Politics in Ayutthaya, there was always a race to the throne. Some kings reigned only seven days or a few months. Royal guards were honest western mercenaries that specialised in modern weapons. The great enemy of Ayutthaya was Burma. Laos, Khmer, Melayu, and Lanna were often in colonial status. Ayutthaya defeated Myanmar 2 times. The second time, city were burnt difficult to reconstruct. New king moved the capital to Thonburi. It was located on the bank of Chao Phraya River opposite Bangkok. who reformed centralized power structure. the savior independence from Burma, he is courageous warrior, Ayutthaya abstained from fighting with Burma 150 years after his reign. who adopted Western civilisation, he sent the diplomats to France during Louise XIV. his reign represented the peak prosperity and the last strength of Ayutthaya. Ayutthaya was the trade centre. There are the archives recorded about the kingdom and way of life written by the Western diplomats, missionaries and trade representatives. The widely known are "Du Royaume de Siam" written by Simon de La Loubère, ambassador of Louis XIV of France. He stayed in Ayutthaya for 3 months and did some reading before arrival. Another is "The Short History of the Kings of Siam"written by Jeremias Van Vliet, Dutch trade agents who lived in Ayutthaya for 9 years. He got some information from his Mon wife. Both books were recorded during Ayutthaya middle period. 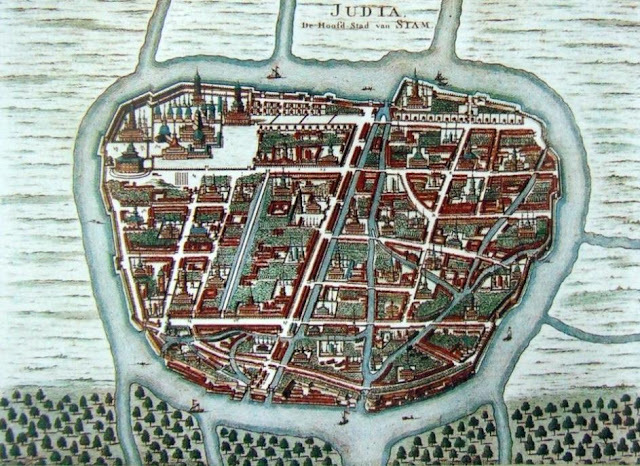 Westerners also knew ancient Ayutthaya from map such as "Judia, De Hoofd-Stad Van Siam" by Francois Valentijn (printed in 1724 AD / 2267 BE). He wrote “Old and New East-India” (Oud en Nieuw Oost-Indiën) a book about the history of the Dutch East India Company and the countries of the Far East. With a prototype of watercolor paintings by Johannes Vingboons, the mapmaker and watercolorist who was hired by Dutch East India Company to paint the image of 10 ports in Asia during the reign of King Prasat Thong. 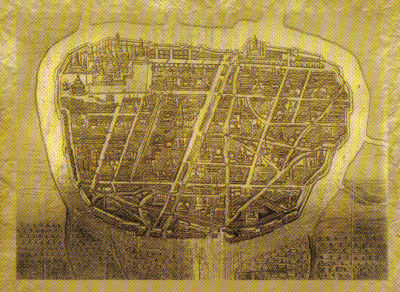 First published in "The Atlas of Vingboons" on 1636 AD / 2179 BE. Apart from Dutch, there were world travelers and mapmakers such as French, Italian, German and Portugal.